DOG OVERBOARD! Pet safety for your boating adventures : Atlantic Yacht & Ship, Inc.
Dog overboard! Those are two words animal lovers never want to hear. Living in Florida, its inevitable pets will accompany their owners on a variety of water adventures, boating being number one. If you are a boat owner that enjoys having man’s best friend with them wherever they go, it’s time to talk pet safety for your boat. First and foremost, bring your dog on board prior to any trips to scope out the environment. Let them get use to the space so it will be familiar. Ensure your dog has an area on the boat that he/she can feel is his own. For example, place their water dish, dog bed and toys on a nonslip mat. Spend some time with your dog in their designated area. Secondly, invest in a life jacket for your dog. These are inexpensive and can save their lives. Although many of us think dogs are great swimmers, there are environmental factors to consider such as the current and depth of water. Most of the animal life jackets have a handle on top that make it easy for grabbing in the case he/she went overboard. Lastly, you need to consider the fact that your dog can potentially get a sunburn just like you can. Keep your dog shaded and apply a canine sunscreen, especially for short hair dogs and ones with white fur. 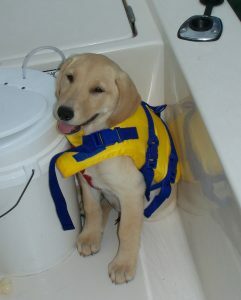 How cute is this yellow lab in her life jacket? Meet Sunny a beloved member of the Atlantic Yacht and Ship family. Her owners understood the importance of pet safety when she was just a pup. Sunny is now seven years old and enjoys boating adventures with her family. In any event, we encourage you to practice pet safety when on the water.